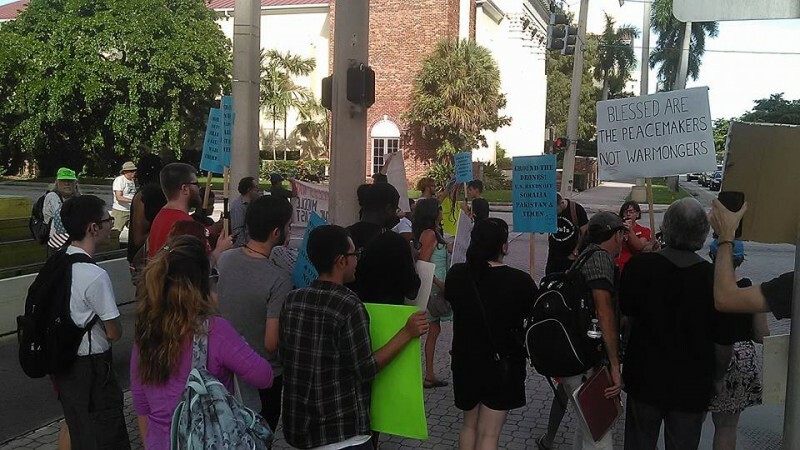 Anti-war march in Ft Lauderdale demands ‘U.S. out of the Middle East!” | Fight Back! Fort Lauderdale, FL- Over 50 protesters from several different cities gathered outside of the Federal Courthouse here, Oct. 8 to mark the 15th anniversary of the U.S. war in Afghanistan. They demanded that the U.S. stop intervening in and occupying countries in the Middle East, an end to U.S. drone strikes, and to end all financial and military assistance for Saudi and Israeli war crimes. People then gathered in a circle to hear a lineup of speakers comprised of local leaders in the progressive activist movement, including organizers with the Green Party of Broward and Black Lives Matter Alliance of Broward. One of those who spoke was Craig Watts, a Christian minister and member of the Disciples Peace Fellowship. The protesters marched for about a mile taking up one lane of traffic, despite police cars following them and warning them to get off the streets or face arrest. Passing cars honked and gave peace signs to support the protesters. Toward the end of the march, they took over the intersection at Broward Bouldevard and SE 3rd Street and blocked it for a one-minute long moment of silence for victims of U.S. wars. The group then wrapped things up by listening to a final list of speakers from groups like Al-Awda South Florida and Peace, Justice, Sustainability Florida. Galvanized by a strong sense of solidarity, those in attendance vowed to continue resisting U.S. wars abroad and to keep organizing locally against U.S. imperialism at home and abroad until justice is won.